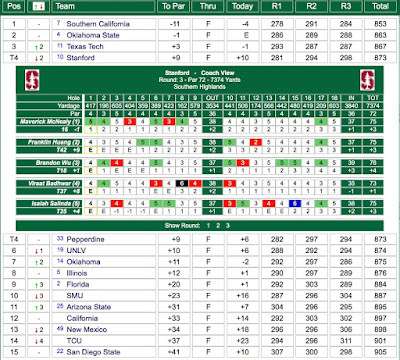 Playing a challenging course against a strong field, a tough final round of 10-over par 298 dropped the Cardinal into a tie for 4th, 20 strokes behind the winning USC team. All 5 starters were over par in the final round and only Viraat Badhwar managed an under par nine as he closed with a 1-under 35 on the back nine. 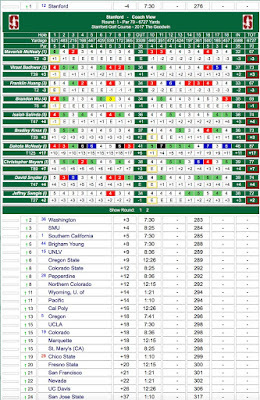 Maverick McNealy (67-73-75 215) finished 5 strokes behind the individual leaders and in 16th place, followed by Brandon Wu who tied for 18th on rounds of 71-70-76 217. Next low was Isaiah Salinda who tied for 25th at 220 with rounds of 70-75-75 followed by Viraat Badhwar with rounds of 75-76-73 224 to tie for 37th and Franklin Huang scoring 73-77-75 225 to tie for 42nd. Final standings and 3rd round Stanford scoring is shown below - click on image to enlarge. The Cardinal returns home to host The Goodwin on March 30-April 1st begins a stretch run to NCAA championship competition. LAS VEGAS - No. 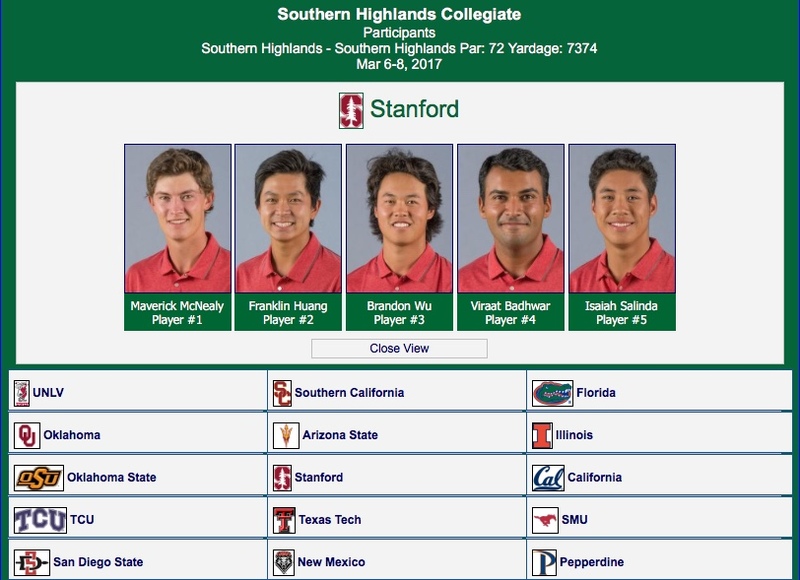 10 Stanford overcame less than ideal scoring conditions Tuesday to remain in contention for the men’s golf team title at the Southern Highlands Collegiate. A very severe test of golf awaited the Cardinal, and the team made enough good decisions while facing challenging pin locations on the par-72 track. 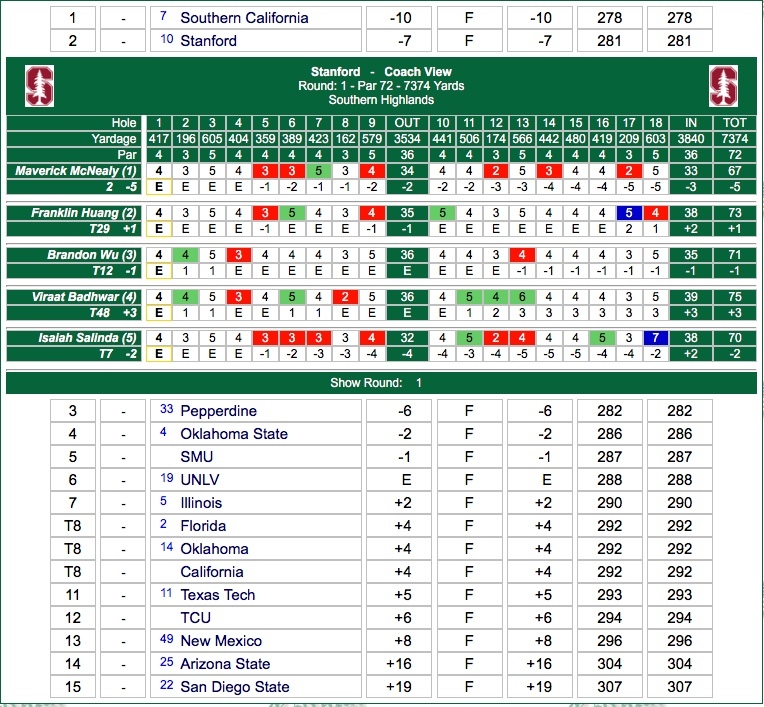 Stanford teamed to record a 6-over 294, and currently stands in second behind clubhouse leader USC. 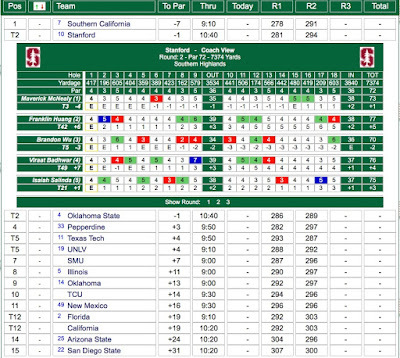 Through 36 holes, Stanford is 1-under while USC is 7-under. 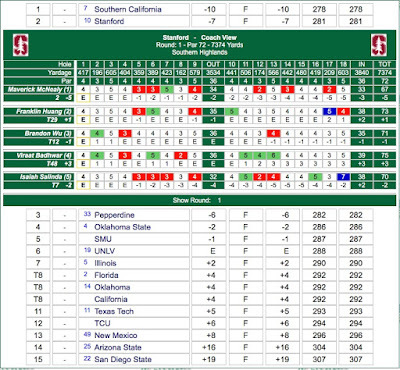 Oklahoma State is tied with the Cardinal at 1-under. 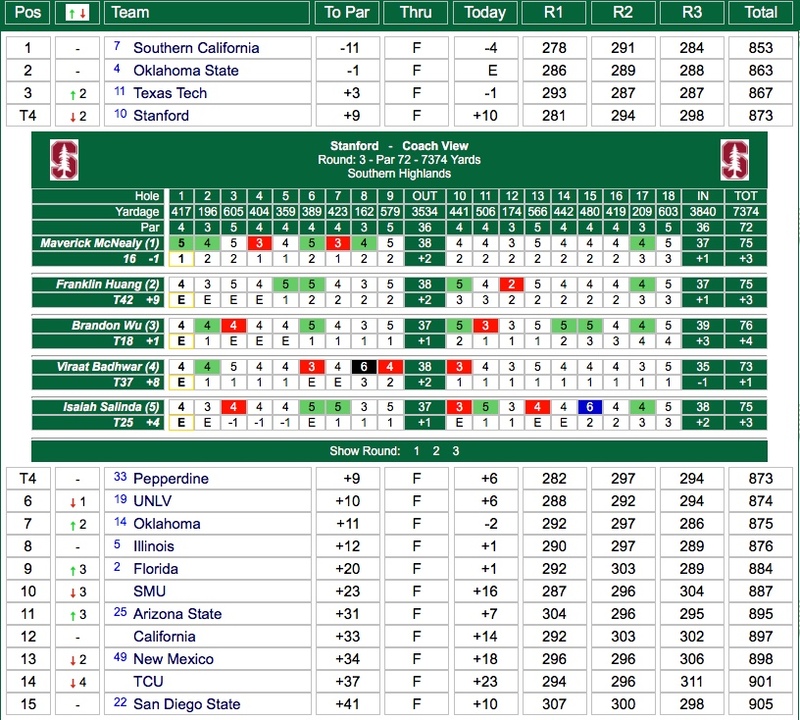 The 54-hole tournament at Southern Highlands concludes Wednesday with live results available at GoStanford.com. Brandon Wu, tied for fifth (71-70 141 T5), finished with a 2-under 70 to pace the Cardinal. He had three straight birdies while making the turn on holes eight, nine and 10. Wu was three strokes better than third-place Maverick McNealy (67-73 140 T3), who was 1-under through 14 before back-to-back bogeys on 15 and 16. 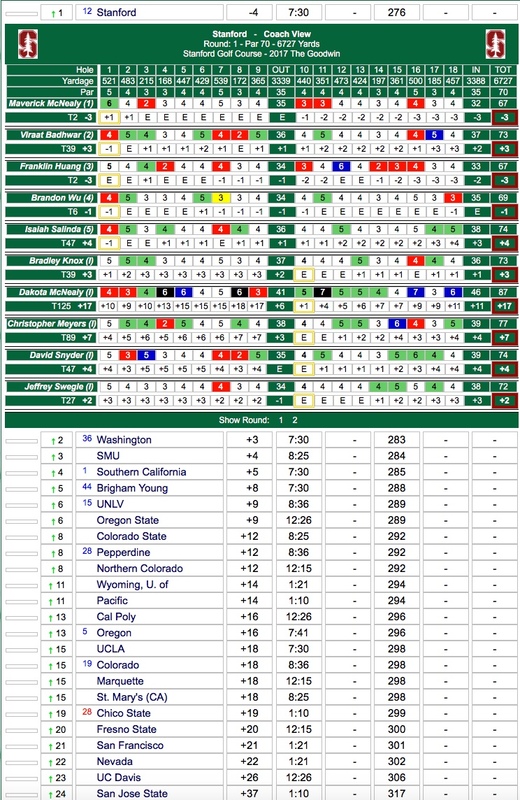 McNealy finished 1-over on the day and is 4-under through 36 holes. 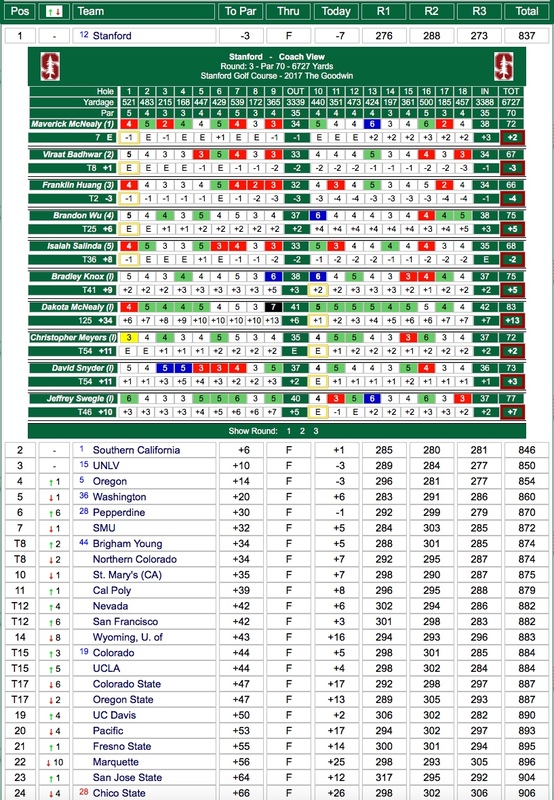 McNealy is chasing clubhouse leader Collin Morikawa of Cal, who leads the field at 7-under. A win would be the 12th of McNealy’s college career, breaking the school record he shares with Tiger Woods and Patrick Rodgers. Isaiah Salinda (70-75 145 T21) is tied for 21st at 1-over after he carded a 3-over 75. Franklin Huang (73-77 150 T42), tied for 42nd at 6-over, birdied 18 for a 5-over 77. Viraat Badhwar (75-76 151 T49) had two birdies during his 4-over performance. LAS VEGAS - No. 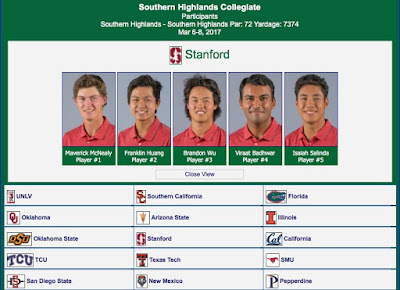 10 Stanford received red scores from three student-athletes Monday in the opening round of the Southern Highlands Collegiate. Maverick McNealy (-5), Isaiah Salinda (-2) and Brandon Wu (-1) each rank among the top-13 individuals after stellar rounds on the par-72 track. The Cardinal, which finished second in last trip to the event in 2014, sits at 7-under after teaming for a 281. Stanford is second overall and USC (-10) leads the 15-team field. 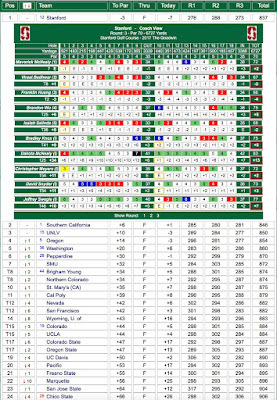 Cal’s Collin Morikawa (-6) set the pace in the medalist race. 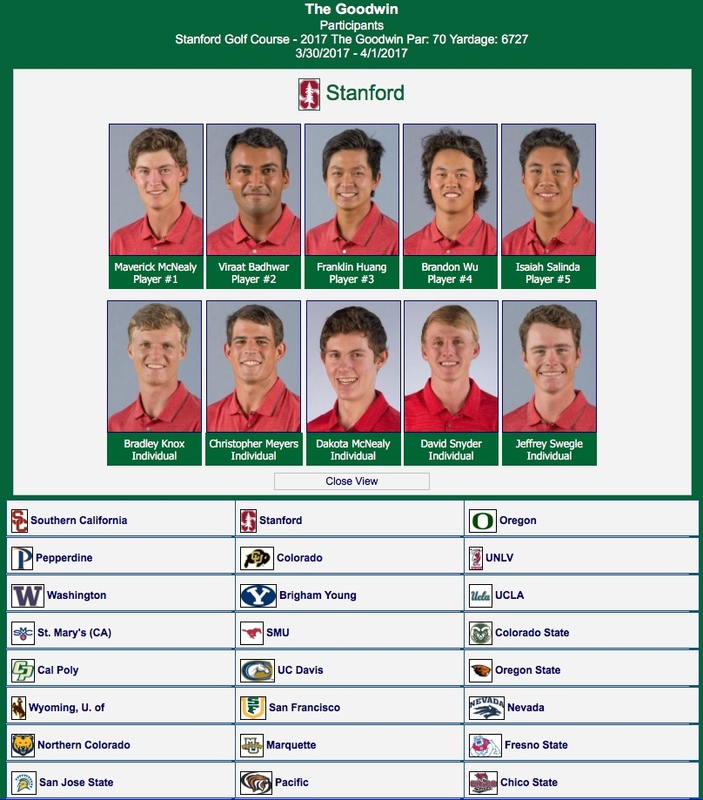 "You’re doing alright when you can get out to a good start and among the top few teams at Southern Highlands," said Conrad Ray, Stanford’s Knowles Family Director of Men’s Golf. "It’s a strong field and really challenging golf course. Only one player on the team has seen the golf course before, and we had a tough, windy practice round. "I feel like our guys are still learning their way around. We dropped a few shots at the end, then picked up a few. We’re looking forward to a good day tomorrow." McNealy, one shot off the lead, didn’t strike the ball particularly well, but his putting game was on point. Six birdies and one bogey led to a 5-under 67. He was 3-under on the back nine, including near chip-ins on 16 and 18. Salinda burned through the front nine at 4-under, recording a stretch of three birdies on holes five, six and seven, and another on the ninth for good measure. Sitting at 5-under through 13 holes, he gave a few shots back to card a 2-under 70. Salinda, McNealy and Huang each birdied the 359-yard fifth hole, a drivable par-4. Salinda is tied for seventh and Wu is 12th after a steady 1-under 71. Franklin Huang closed with a birdie on 18 to finish at 1-over, and Viraat Badhwar managed a pair of birdies on the front nine to finish at 3-over.